Real Estate in Tucson boast beautiful Sonoran desert and rugged mountain backdrops with a mix of architecture stemming from modern, mud adobe, rustic ranch estates, Victorian, and Barrio. 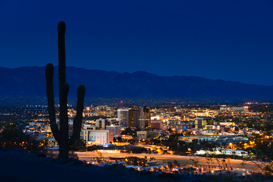 Homes in Tucson AZ range from economical starter homes and condominiums to country club residential developments and restored historic properties, many dating from the early 1900s. Each Winter the Saturday before Thanksgiving, Tucson hosts the “El Tour De Tucson” attracting over 9,000 cyclists . Every year in February, the acclaimed “Tucson Gem and Mineral Show” brings in an estimated 250 dealers from around the world show casing gems and minerals. This is the largest mineral show in the United States. 360 days of sunshine offer recreational enthusiasts a variety of hiking, biking, and outdoor activities. Catalina State Park, Mount Lemmon State Park, Saguaro National moment East and West, Madera Canyon, Colosso Cave, and Kartchner Caverns are all havens for nature lovers.